How many of you are finished with Christmas shopping? It always amazes me that there are people who finish before Thanksgiving...if only I were one of those people! I have yet to even start...YIKES! Here are a few gift ideas for the little tikes on your list! 1. A chic and colorful collection of children's classics...you could even break the set up if you have several kids on your shopping list. 2. He can feel like dad or be the ultimate outdoor explorer with this camper watch. 3. How fun is this robot shaped pillow?! 4. The company that started these bikes...or Zikes is actually based out of my hometown in SC. Everytime I see the store it looks so fun..I kind of want one..and I'm sure every kid would too! 5. Whale bookends! What?! Pair this with #1 for the ultimate gift! 6. This headband is perfect for the little diva in your life! 7. 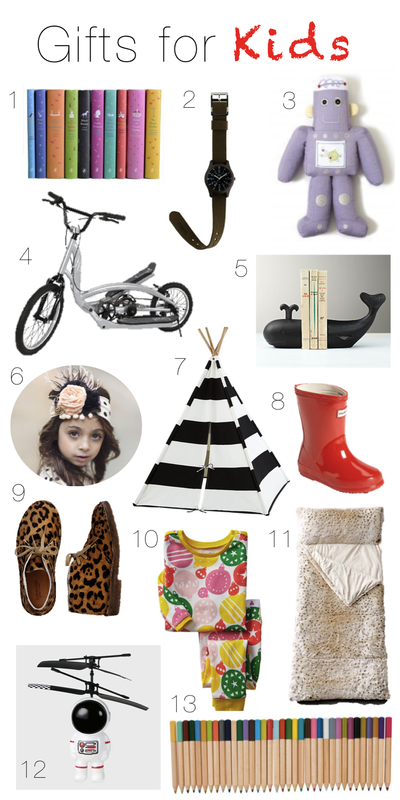 What kid wouldn't love a teepee?! I know with all of the forts we built as kids I would have died over this! 8. First rain boots..a necessity and so cute. 9. Leopard booties...little girls clothes and shoes just get me! 10. Ornament pjs for Christmas Eve...how many of you do this tradition?! 11. a faux fur sleeping bag...perfect for sleepovers...or being booted to the floor while family is in town for Christmas?! 12. Ok..this is so cool...better than a model helicopter...its a remote control flying space man! 13. Every color you can think of is in this pencil set and its a steal at $6!